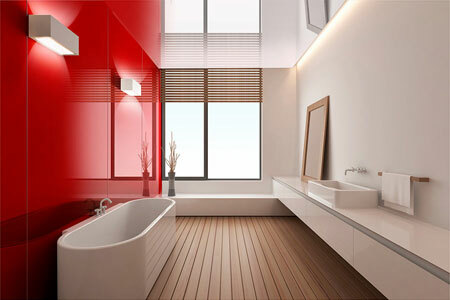 High gloss acrylic walls provide a sleek, contemporary look for bath/shower walls and kitchen backsplashes while being light and easy to work with. Learn the many benefits of this product below. The high gloss acrylic wall panels created a fresh clean European look with a luxurious and elegant finish. Choose from a wide range of fun colors like arctic, blue atoll, glacier, mocha, carbon and rouge to dress up any indoor residential or commercial space. Lustrolite panels from Innovate Building Solutions can be used in bathrooms, bedrooms, media rooms, hallways and commercial lobbies to name just a few rooms. Cool, eclectic and exciting are just some of the words used to describe these panels. While tile is the most commonly used material in shower and tub wall panels and kitchen backsplashes most people hate the cost and hassle of cleaning and resealing grout! With these innovative wall panels you’ll get a sleek euro look and eliminate the effort and cost of maintaining grout. These smooth/non-stick walls are easily cleaned with warm water and a soft cloth. High gloss acrylic panels are 25 times tougher than glass with 1/2 the weight. Back painted glass is also very stylish - but in most cases will be 2 times as expensive as high gloss acrylic wall panels. High resistance to UV light, cracking and chipping makes this is popular materials vs. glass, ceramic tiles, aluminum or wood. These high gloss acrylic panels can be cut drilled and shaped with common woodworking materials and the panels can be set with double sided foam tape and neutral cure silicone. Installation will take 1/3 of the time of a tile job. In wet applications likes showers, tubs and backsplashes it’s nice to know with high gloss acrylic walls you don’t have to worry about moisture growing behind the wall. 4 panels sizes help to minimize costs and make more efficient designs. If you’re a DIY person Innovate Building Solutions can wholesale these panels direct to you and provide free nationwide shipping as well. On regional basis we provide professional installation service as well.